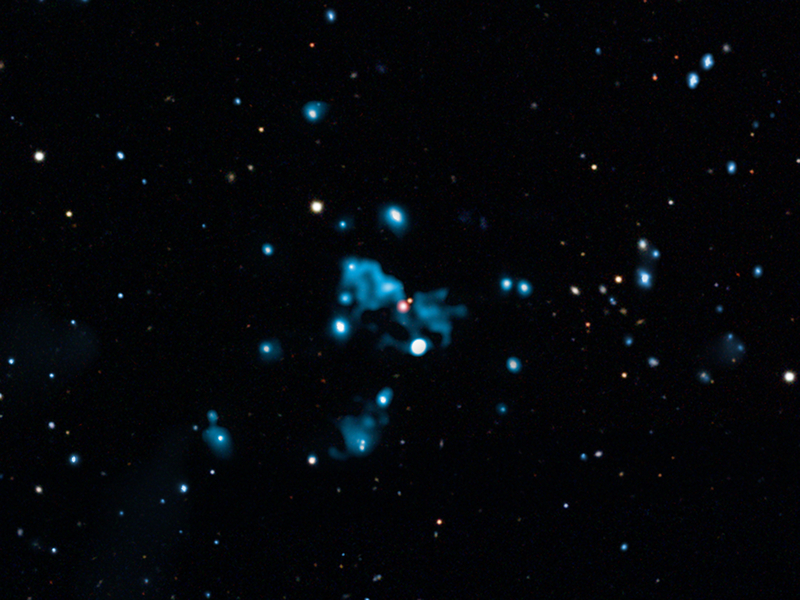 HDF is a diffuse X-ray source located over 10 billion light years away. This ghostly source was generated by a powerful eruption from a supermassive black hole in a large galaxy. Such X-ray ghosts last longer than the original black hole eruptions allowing the impact of these outbursts to be more easily studied. The diffuse blue object near the center of the image is believed to be a cosmic "ghost" generated by a huge eruption from a supermassive black hole in a distant galaxy. This X-ray ghost, a.k.a. HDF 130, remains after powerful radio waves from particles traveling away from the black hole at almost the speed of light, have died off. As the electrons radiate away their energy they produce X-rays by interacting with the pervasive sea of photons remaining from the Big Bang - the cosmic background radiation. Collisions between these electrons and the background photons can impart enough energy to the photons to boost them into the X-ray energy band. The cigar-like shape of HDF 130 and its length of about 2.2 million light years are consistent with the properties of radio jets. HDF 130 is over 10 billion light years away and existed at a time 3 billion years after the Big Bang, when galaxies and black holes were forming at a high rate. 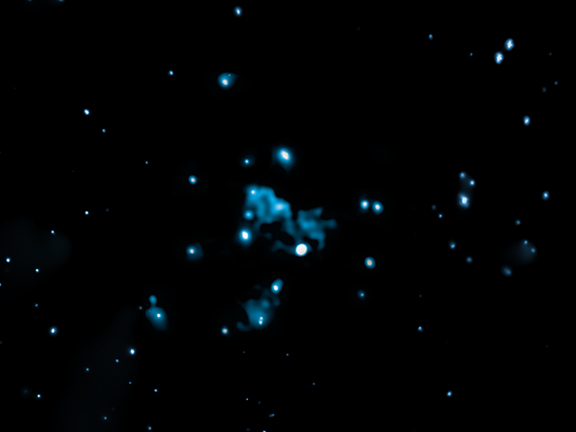 Near the center of the X-ray ghost is a radio point source indicating the presence of a growing supermassive black hole. This source corresponds to the location of a massive elliptical galaxy visible in very deep optical images (not shown here). The nearby red object in the SDSS image located immediately above and to the right of the radio source is another, unrelated galaxy located closer to the Earth. Coordinates (J2000) RA 12h 36m 17.6s | Dec +62° 15´ 44.5"
Beautiful and inspiring work. I have loved astronomy all my life and you do good work. There will be many other massive black holes in this constellation, all located outside our galaxy, and possibly some stellar-mass black holes located inside our galaxy. No evidence is known for a black hole only 2.1 light years away in any direction. Have You ever Found a Black Star in Pegasus at 2,1 ly? 10,000,000 light years away, wow, brilliant photo. An image of an event that occurred before our Solar System was born. Incredible. Thank you ever so much. Your images and explanations make my day. Outstanding. I know it takes a lot of work and all we have to do is sit here in awe. Keep up the good work. Your excellent work and images are noted in the online Daily Galaxy news. Thanks for your work and sharing. is that they are relatively strong noise fluctuations in the image. That is, they are not likely to be real astronomical objects, like galaxy clusters. Because the X-ray ghost is faint, an image that is optimised to show it will inevitably show faint signals from noise. Thanks for such a wonderful image explanation, hope to see more in coming days.